The animals noticed it first, like they always do. Dogs were too afraid to go outside, birds flew south too early, and cows started producing milk with a distinctly foreboding taste. Now parents across the land are keeping their kids indoors, and the sun has been setting sooner and sooner—as if it’s eager to plunge us into darkness as quickly as possible. There’s a chill in the air, and no number of hoodies can stave off what it signifies: NBC is up to something. With Adam Levine’s Kids In America, the Ten Commandments-based show, the exorcism drama, that grandpa adventure show, Weight For Love, the police anthology series, and the one that sounds like a game show but is really a sitcom, NBC has picked up a new show—or announced the development of a new show—almost every day in September. 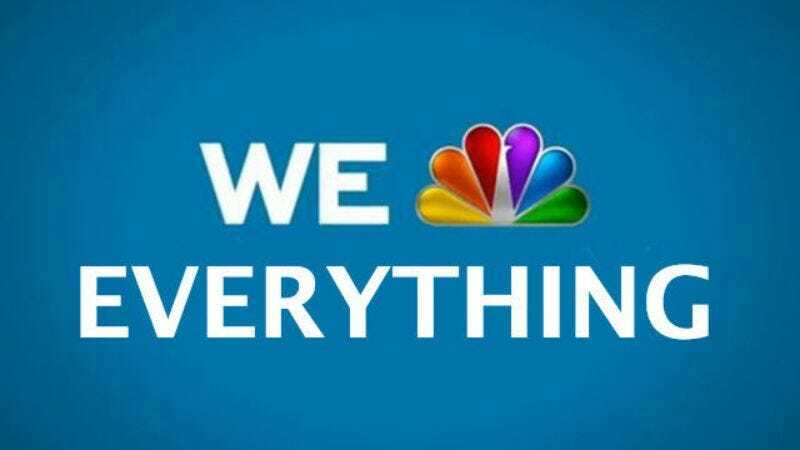 That startling pattern continues today, with Deadline reporting that NBC has picked up two more shows: One about a blogger living in New Jersey, and one about two couples sharing a home in New York. The New Jersey one comes from Happy Endings writers Steven Cragg and Brian Bradley, and it will focus on a “pop science blogger” who moves to the suburbs to start a family. Being an enlightened city person, he is intrigued by his new neighbors and their precocious suburbanite ways, so he starts writing about them “in the style of an anthropologist who’s stumbled on an undiscovered tribe.” Nope, nothing condescending about that. Parenthood’s Jason Katims and Julia Brownell created the New York show, which is titled The Walk-Up. It will reportedly be a multi-camera comedy about two couples who decide to buy a home in Brooklyn and live in it together. Stupid people living in the suburbs would surely be confused by such a unique situation, but intelligent city people should find it properly humorous. We don’t know what NBC is planning to do with all of these shows, but we’d wager it has something to do with wanting to have enough projects in development that it can safely cancel every single thing it has and still be able to fill a schedule. This “scorched earth” method of running a TV network might not seem rational to us regular people, but NBC is actually playing a game that’s so above our heads that it would be surprising if anything it did made sense. Either way, look for NBC to pick up another 15 or so new shows by October.